“We are still in” totalitarians flunk basic reality | Watts Up With That? * We are still IN and committed to the restrictive, punitive, anti-hydrocarbon Paris regime – except when it comes to benefitting ourselves from coal, oil and natural gas … to fly or drive to Poland; heat and light our homes, offices, hotel rooms and exhibits; eat well; dress in synthetic fibers, or in cotton or woolen garments made possible by fossil fuels; and utilize hydrocarbons for cell phones, computers, cosmetics, chairs and display boards at our exhibits, eyeglasses, wind turbine blades and countless other products. Amid virtually all their politicized campaigns, these groups appear to be engaged in climate science and energy fraud. Whether it’s global temperatures, changing weather patterns, Arctic, Antarctic or Greenland ice, hurricanes and tornados, wildfires, floods or droughts – or the need for and viability of renewable energy – deception, misrepresentation, disinformation and even fabrication are their stock in trade. Their motto should be ” We are still INsane” ! These people are quite sane. The are riding the “Climate Change” gravy train for all that it can supply them. Their politically correct governments give them air travel, luxury accommodation, etc with no hint of the irony and hypocrisy of their actions. I try to state the facts, to the best of my ability. We published the following conclusions in 2002. The past decades of actual global observations adequately prove that these two statements are correct to date. Allan MacRae, B.A.Sc., M.Eng., P.Eng. By Dr. Sallie Baliunas, Dr. Tim Patterson and Allan MacRae, P.Eng. The far-left Greens are the great killers of our age, rivalling the death tolls of the great killers of the 20th Century – Stalin, Hitler and Mao. When the West finally wakes up, there will be an enormous backlash against the Greens, who are not only sabotaging our economies but are causing enormous harm to the world’s poor through deliberate energy starvation – and their past crimes, such as the war on DDT that also caused tens of millions of deaths, mostly children under 5 years of age. Global Warming (aka Climate Change) alarmism is not only false, it is fraudulent, promoted by scoundrels for personal, financial and political gain. The climate computer models cited by the IPCC deliberately employ values of climate sensitivity that are ridiculously high, in order to create alarm – all their models run far too hot, compared to observations. The Mann hockey stick (MBH98 etc.) was cited several times as the centerpiece of the IPCC’s 2001 Third Assessment Report. We knew that the Mann hockey stick was false when it was published in 1998, because it contradicted the historical climate record, eliminating both the Medieval Warm Period and the Little Ice Age, in order to bolster global warming alarmism and promote costly, ineffective and destructive green energy schemes. Environmental harm from these green energy schemes included accelerated draining of the vital Ogallala Aquifer for corn ethanol production in the USA and clear-cutting of the rainforests in South America and Southeast Asia to grow biofuels. These actions continue to cause huge environmental damage. Energy costs have been sharply increased, vital electrical grids have been destabilized due to the intermittency of wind power, and Excess Winter Deaths have increased. I don’t believe the goal is to eliminate fossil fuels at all. Asking for something that is impossible to deliver is just a tactic to help get what they really want — wealth transfers of whatever amounts they can get. “We need you to spend $2.4 trillion per year… No? Okay, we need you spend $2.1 trillion per year… No? Okay, instead of prevention, let’s do $500 billion per year for reparations. No? Okay, we’ll start with $100 billion. As a start. Sign here please.? Many politicians might sign up their governments for things that their citizens don’t understand in order to win votes from the citizens who would be getting screwed. By the time they figure it out, legal commitments will have been made. There is a high probability that these so-called “green” politicians are getting kickbacks. Few politicians are so extremely stupid as to actually believe their climate-and-energy nonsense. If what you say is true Steve, it will only work for really stupid politicians. Does this alleged Green strategy sound highly illogical to anyone else? It’s quite logical Allan. Once they take out their “management” fees, what do you think they will spend the money on? It’s not about the environment, it’s about securing a huge income stream to fund the next stage of the plan. I don’t know what that is, but I’ll bet that it has something to do with destroying the evil and immoral capitalist system. It would be very benificial if the authors of this website start a PETITION of climatoligists or equvilant credentials who do not believe in AGW. This petition needs to be cirulated by those who endorse it and others, to let the general public know that there in not a consencious on this topic and to refute the massive propaganda to the contrary and “The science is settled” narrative. It would be very beneficial if the authors of this website start a PETITION of climatologists or equivalent credentials who do not believe in AGW. This petition needs to be circulated by those who endorse it and others, to let the general public know that there is not a consensus on this topic and to refute the massive propaganda to the contrary and “The science is settled” narrative. Until someone like you does this, the pro AGW supporters will control the narrative and millions of carbon tax dollars will be sheared from the people of the world to no end but to enrich those behind this disgusting fraud. “our refusal to civilly debate any climate or energy issues – and our determination to ignore the horrendous ecological impacts of our ideas, and the even worse impacts that our demands have on other people’s jobs and living standards. And especially how our demands ensure that African and Asian parents and children have energy-deprived, impoverished, malnourished, diseased, brutally short lives. He wants CIVILITY? And this is the kind of trash he dishes up? What is this post but a bunch of throwing around insults? Grow up. Contribute something interesting. It’s not only despicable, it’s boring. Climate mongers deserve no civility from others. I don’t like this article because it preaches to the converted and is likely to persuade no one. That said Kristi, what is it in the text you quoted that is demonstrably wrong? That paragraph, rudely or otherwise, speaks the truth. Your side refuses to debate, or even allow debate. The impacts of the proposed solutions to climate change are, in fact, worse than the disease. Read IPCC AR5 section on economic impacts, pay special attention to figure 10-10. Further, the proposals to reduce CO2 would in fact reduce standards of living in 1st world countries, but it would devastate 3rd world countries (regardless of their racial mix), while enriching mega corporations who feed at the public trough under the guise of saving the world. Uncivil? Maybe. Sometimes the truth is ugly Kristi. Instead of whining about how uncivil it is (a blatant attempt to shut down the discussion without discussing the substance) why don’t you instead debunk it? Visceral beliefs cannot be discussed because doing so risks exposing the fault lines of illogic, irrationality, double standards, hypocrisy, etc., that would threaten and undermine self identity built on those beliefs. if Kristi could debunk it s/he would have. But Kristi can’t because it’s true and Kristi knows it to be true, hence the lashing out without once touching on the substance of the article. Al Gore’s Church of Climatology is causing suicides, divorces, schoolchildren boycotting schools, carbon tax protest deaths in France, pensioners dying of the cold and 2 billion people denied electricity because the World Bank won’t lend money for coal or gas plants. I am glad you are still here Kristi. Eventually you will conclude that you were lied to. This site is different from the alarmist websites. We relish the debate because we know we have the truth on our side. They don’t . Don’t hold your breath. kristi considers her/himself so intellectually superior he/she need take notice of no one but him/herself. The left wouldn’t recognise a lie of theirs if it jumped up and bit them on the arse. I do not speak to Kristi, but rather to all the extreme leftist-Greens out there. Extreme leftist-Greens suffer from The Dunning-Kruger Effect. Try rebutting his assertions or just shut up. Yes, this post is “throwing around insults”. Its a form of prose that is part of the blend of literature that makes this site more robust in its content, approach and appeal to a diverse audience. Are you against diversity and just want one monotone voice from article to article? To me, its a nice break from the charts and peer reviewed reports. You may be bored, but it also has motivated you to respond, in kind, with insults, exclusively – so clearly Paul Driessen has communicated to you in a form of expression you best relate. Mission Accomplished. And while another commentator has opined that this is “preaching to the converted”, what exactly was the Katowice event than a high-celebrity mutual admiration cult? The “We are all going to die” and the overt “This is All Trump’s Fault” temper tantrum is supposed to have some great manipulative powers? The Left uses words to trigger emotions – mostly rage. Emotion, after Hunger, is a huge motivator, so skilled yet lazy manipulators will use emotions to delude and manipulate by short-circuiting the intellect and reasoning portions of our decision process. Paul targeted your emotion and behold, you let no one down by lashing out. @kristi, “turn the other cheek” stopped working with this group years ago, ‘civility’ to a group that is using Saul Alinsky’s Rules for Radicals? I spent some time yesterday being berated as ‘stupid, ignorant, scientifically illiterate then finally likened to the money grubbing scientist that lied about tobacco while people died from a person I knew would have a heart attack if I responded in like. I can not grasp how a group that has absorbed trillions of tax payer dollars can accuse anyone of being ‘on the take’ for the oil industry…. an industry that generates trillions of dollars to the government. I was once shouted down at a HOA meeting by a group that wanted ‘free’ stuff, when I tried to explain the ‘cost’ of the ‘free’ stuff. I can understand Paul Driessen being ‘disgusted’ with the AWG crowd, this article reflects his frustration and provides some nice talking points, thank you Paul Driessen, but talking points are useless when those that need to listen won’t since rule 11 is being applied. Perhaps you missed the fact that 60,000,000 babies have died as a direct result of this global warming scam? Rather than feigned offense and puffery, try to gather your thoughts and respond with a few facts to dispute this post. Official WHO figures state they expect 120,000,000 people in developing nations to die of smoke inhalation related conditions by 2050. You know this because you challenged me on it before and I pointed you to the site. 1,000,000 people in developing nations are expected to go blind, then die from vitamin A deficiency, easily addressed by allowing the growing of golden rice. 500,000 people a year are expected to die as a direct result of poor sanitation. And you have the gaul to suggest that a journalist with some harsh truths expressed about this murderous, self serving, virtue signalling succession of luxury conferences attended by those only concerned about maintaining their wealthy, privileged way of life is wrong? For the last 40 years the west has actively opposed industrialisation and progress within these countries, yet lay the blame for their persecution at the door of fossil fuels, the very means of their salvation. Their is nothing wrong with what Paul Driessen published in this article, there is however, a lot wrong with your attitude and care for your fellow man whilst sitting at home in relative luxury criticising from afar. There is also a lot wrong with people of your mentality haranguing an entirely peaceful presentation by an organisation that didn’t agree with their mentally deficient view of the world. What are these people frightened of if they countenance a peaceful delegate being thrown out of a conference on climate? If that’s the accepted norm COP conferences are not conferences, they are closed shops and echo chambers for the propagandist faithful. People of your ilk are the criminals, the persecutors, the genocidal maniacs because you brook no dissent. You peddle your miserable trade under cover of left wing values, infect politicians and the MSM with your pretence of caring for others whilst utterly ignoring that socialism of whatever flavour, has proven an abject failure wherever it’s been tried. You simply do not get it. The concept of free trade, freedom of expression and freedom of movement are what the human race has been built on since man first traded shells for services. Attempting to manipulate mankind to conform to an artificial ideology of equality and fairness to all simply exacerbates the plight of the poverty stricken, which is blindingly obvious to anyone who cares to think about it for more than a nanosecond. If you’re so concerned about climate change and the plight of mankind then do as you have been invited to many times on this blog, lead by example; give up any and all use of fossil fuels and products derived thereof. That includes your computer, you house, your clothes, car bicycle, transport, heating and your food. But you won’t, will you kristi? You’ll talk the good talk but you won’t fight the good fight. You’ll preach from afar and judge others whilst you recline in luxury. Absolutely typical of a left wing do gooder, do as I say, not as I do. Well, she’s said she lives out in the middle of nowhere. The whole trouble with your post is that you don’t know me. You don’t know my beliefs, you just lump me with some fantasy group that has all the same ideas and values. It’s wrong. You are wrong. And it’s people like Driessen who encourage this false dichotomy – either for or against fossil fuels – and encourage the kind of hatred you express by vilifying the Other. Don’t lecture me about not caring. And making your false assumptions about who I am and what I think just shows your blinding prejudice. BTW, my electricity is solar. Kristi Silber: Unintentionally, you reveal your true character through your posts. HotScot knows you much better than you think. No he doesn’t. What he does know is what you post. If what you post isn’t reflective of who you are, that’s not his fault. and BTW, From the posts of yours I’ve read, HotScot is spot on about you, so I’ll just have to take you at your word that your posts aren’t reflective of who you are. Which means you are deliberately posting something that you don’t really believe (by why would you do that?) or you are posting what you really believe and just don’t like how that makes you look to others. Solar is piffle power. If you want to really raise the standard of living, it takes industrual-strength base load provided by fossil fuels, nuclear, and hydro! Solar only gives people a taste of the good life. Once again Kristi strains at gnats but ignores camels. Compared to the stuff dished out daily by her allies, and at times by Kristi herself, the stuff here is quite mild. Not if I had my way! Agreed Kristi, but I’m growing tired of all this bollox. Something accurate, something reasonable and balanced, free of ad hominems and pettiness, something that helps to clarify the issues either way, without distortion, something that’s free of prejudice, surely isn’t too much to ask for. or is it? In other words, something scientific that might in time restore this site to respectability. That would be great. This article was simply an image damaging rant that squares all too neatly with the all too frequent propaganda pieces that pander to the extremists on here, that render this site irrelevant to the debate. More real sceptics and real scepticism would be a good place to start. Jim Hogg: I look forward to your next post which meets your own ‘criteria. Based on all his previous posts to date, I suspect you’ll have a long long wait indeed. The commenters on here, most of whom are technically qualified, are extremists? Really? We’re sick and tired of being insulted and patronised by the Global Warming proponents, who are the real extremists and fanatics. Hit a nerve did it, Kristi? the truth hurts. It is not trash Kristi. It is merely a description of the trash meeted out by the IN brigade on a daily basis. Clearing it all up is a major task. I note you do not challenge any of the descriptions. Perhaps you do not like the smell. Are you claiming that “throwing around insults” is an exclusive privilege for progressives? Kristi – you really don’t listen to the rhetoric on your side do you? Nor do you seem to appreciate the consequences of the policies you endorse. I’m sorry, but it’s past time for all that, and we can’t wait for you to ‘grow up’. Calling out people who advocate policies that will result in mass murder is “boring”? Which way does your moral compass point? …. and they are INane. Paul D. & the Committee For A Constructive Tomorrow (CFACT) should work to bring such investigations into being. But don’t hide the effort like the Bloomberg group did by paying for assistant AGs. And be of good cheer. Well, if a lack of self righteous indignation from grumpy old men was holding back the cause, this should get things back on track. Did the conference thank the Polish coal-miners for supplying reliable electricity for the conference? According to Weather Underground there was snow or rain for all but one day of the two weeks of the conference. Accuweather suggests a little sunshine on two or three more days. Photovoltaics would have provided little electricity. Neither source mentioned wind, but that seems doubtful with so much snow and rain. Perhaps that’s an idea for the future. The next COP25 will be fully 100% renewable energy. We look forward to that. Poor countries should consider bringing similar human rights lawsuits in US, EU and international courts. Today, it is clear to all normal people that the risk of climate change is realistic, it is also clear that the extraction of fossil fuels does not work fast enough. This is primarily demonstrated by French events where Macron has attempted to take a little step forward. Therefore, geoengeneering solutions need to be introduced quickly, which do not cause economic problems and are fairly cheap at the same time. That statement is the usual nonsense. “Climate change” is rarely if ever defined – it is a deliberately vague statement, not even a hypothesis, because it can mean everything and nothing. The “Climate Change” (aka “Wilder Weather”) hypothesis is so vague and changes so often that it is not falsifiable. It must be rejected as unscientific nonsense. Another piece of evidence for the falsity of the Global Warming hypothesis to add to your list: from the Vostok and other ice-cores, it is now certain that atmospheric carbon dioxide levels FOLLOW changes in temperature, NEVER precede it. Cause must always precede effect. In other words, CO2 concentration is a function of temperature, not the other way round. It may interest you to know that CO2 trends also lag global temperature trends in the modern data record, by about 9 months. We are preoccupied with the notion that CO2 drives global warming, and only argue about “how much” – the unending argument about the magnitude of Climate Sensitivity CS to increasing atmospheric CO2. We must therefore ignore the awkward observation that from ~1945 to ~1977, CO2 emissions increased strongly while Earth cooled significantly, even alarmingly. We must also ignore the awkward observation that CO2 trends lag temperature trends in the ice core record, and also in the modern data record. This does not seem to bother most analysts, who are apparently arguing that the future is causing the past. Well, OK, and how exactly does that work? Oh – it’s a feedback effect? …and what does Occam’s Razor say about that? I leave you with a plot from Humlum et al 2013, which is prettier than the ones in my originating paper on this observation, published in January 2008. Would it be CO2 or is it the spread of heat islands that cause the 1C? The key words above are “AT MOST about 1C” – could be less warming than that. Of course there’s climate change. That’s what the climate does. The question is whether humans are causing runaway catastrophic anthropogenic global warming (CAGW). The fact that the climate changes is in no way a proof of CAGW. Here’s an example. Since the modern Olympics began, people have been setting high jumping records. They go higher and higher. If we extrapolate, humans will eventually be able to leap over tall buildings at a single bound. That’s the quality of the alarmist logic. ‘Of course there’s climate change. That’s what the climate does.’ Then you have to change the narrative. Question from alarmists: Do you believe in climate change? Instead of saying yes ask them, “Are you referring to Co2 induced climate change?”, “Are you referring to Co2 controls climate change? or “Are you referring to Co2 controls global warming?” Throw it back at them. don’t get trapped in their narrative from the beginning. So stuff that has happened millions of times before, is proof that this time they are being caused by more CO2 in the atmosphere? It really doesn’t take much to convince you, does it? Why is it that with several hundred years of successful progress behind us, mankind suddenly faces a future of failure? (according to the climate pessimists). Negative people. I was warned to stay away from them when I was young. I’m sure everyone here is fed up of me saying it, but for your benefit I’ll risk boring them. There are no credible, empirically derived, field studies which demonstrate atmospheric CO2 causes the planet to warm, ever! Go and look for them yourself, you’ll be wasting your time as I found out to my delight. The only scientifically observable effect of increased atmospheric CO2 on the planet is that it has greened by 14% in 35 years of satellite observations according to NASA. On that basis, kindly explain why it is necessary to abandon the source of humankind’s unimaginable prosperity and progress in the last 200 years or so. The response from malkom700 to your logical, well thought out response will undoubtedly be crickets, or some appeal to authority absent (as usual) any substance. Nah. They will simply call you a racist, bigot, DENIER! Their response to anything factual is always to name-calling. though sometimes they do combine 2 & 3 or skip straight to 3. Bet the bulk of those redistributed billions would come from the middle class. Bet the result would be factories and industrialization happening in those countries, manned by very cheap labor. Bet the rich would then make out the most in this scenario. In short, the middle class is going to pay to create economic infrastructure in LDLs and the rich are going to profit from it. It’s already happening but there are no factories and no work for the poor. The corrupt politicians and wealthy warlords in deprived countries make damn sure western money never gets any further than them. Tragically, our western politicians know this, and conspire by ignoring it. Let’s feed the world using horse-drawn combines. I’m hoping that http://www.brilliantlightpower.com will get to market SOON…then we’ll all have enough power to do whatever the heck we want…without the worry of pollution. Mortimer, this is almost certainly a scam. A number of physicists say that the claims made by Brilliant Light Power contradict the theory of quantum mechanics. ROFLMAO! What a delightful way to start the morning. Thank you for providing the link. I almost spit my morning coffee all over the screen when I read the first paragraph. The ‘catalyst’ involved has to be the 21st century equivalent to the Alchemists ‘Philosopher’s Stone’ used to transmute lead into gold, only in this case, it transmutes H into … odd I don’t seem to remember the symbol for Hydrino, oh wait, that’s because it’s ‘dark matter’ and it’s ‘tradmarked’. A ‘Harvard trained doctor’ who ‘studied at MIT’? Now there’s a resume. Anyone who wants to have a good laugh in the morning should read this. It’s really delightful. Flashback to the time the president of a small company I worked for called me into his office to sit in on a presentation by a guy who was looking for VC for his perpetual motion machine – basically an air motor driving an air compressor that fed the air motor. After I drove the guy away, the prez acted like he knew all along it was a scam. Funny. He was a gambler and a drunk. I suspect the rare earth Unobtanium will be required for manufacture of the Suncell device, whose scarcity will limit commercial availability. I go to Pandora every day. All I ever find is music. Hilarious to see CNN has fallen for this absurdity. How credulous can one get? Fantastic! Why wasn’t this the lead story at Katowice? “Free and clean” power for the world – we are saved. However, critics say it lacks corroborating scientific evidence, and is a relic of cold fusion. Critical analysis of the claims have been published in the peer reviewed journals Physics Letters A, New Journal of Physics, Journal of Applied Physics, and Journal of Physics D: Applied Physics on the basis that Quantum Mechanics is valid, and that the proposed hydrino states are unphysical and incompatible with key equations of Quantum Mechanics. But wait: The U.S. Department of Energy has approved funding and start of construction for the SuperCDMS SNOLAB experiment, which will begin operations in the early 2020s to hunt for hypothetical dark matter particles called weakly interacting massive particles, or WIMPs. The screed on the front page reads like gobbly-gook. Nonsense words arranged to confuse the reader. However, their facility is quite large and the car park is full. So whatever is happening there, they’ve got some money. Reductions in fossil fuel use will require a leveling off of the world population. But in many countries, the welfare-state retirement math requires a steadily increasing population. In the US, are liberal Democrats willing to vote for an immediate reduction to benefits? What about in European countries? The “We Are Still In” climate clowns are still Incredibly stupid, know-nothing virtue-signallers who understand nothing about climate, nothing about science, and nothing about economics. They are nothing but carpet-baggers on the CAGW gravy train, hoping to garner some last power and climate dollars from a thankfully, dying ideology. Gee, just think of the savings if these elite “leaders” could be put on their own island some place (with monthly food drops, of course – I’m not stingy) where they can’t leave until they have acknowledged the reality that they are running a scam. If the world’s population were depleted as much as these arrogant soulless persons want it to be, there would be no one to plow the fields, plant the grains, mind the livestock, keep water systems clean, create vaccines to fight diseases, etc., etc., etc. They really do need their own planet where they can rule with no opposition to their plans for the world, and the rest of us can just get on with our lives. In regard to their carbon tax, a few weeks ago, I made it quite clear that the $1,343/ton tax on my gas usage, which heats my home, heats the water heater, and cooks my food, would come to a monthly tax charge of +/- $21,000. That’s per month, not per decade. That means Algorebull would have to cough up the cash for the payment, because my income is nowhere near that high. And the tax is not only unreasonable, it has no bearing on reality. The demands that are made by these demented, greedy individuals have gone beyond the bounds of reality. They are nuts. This nothing but a fraud and no one should listen to them or support them or give them a freaking cent. It is WAY past time this bunch of slugs was sent packing. The Bryan Ferry version of “The ‘In’ Crowd” is better, IMHO. I think we’re all Bozos on this bus… Wanna squeeze the wheeze? 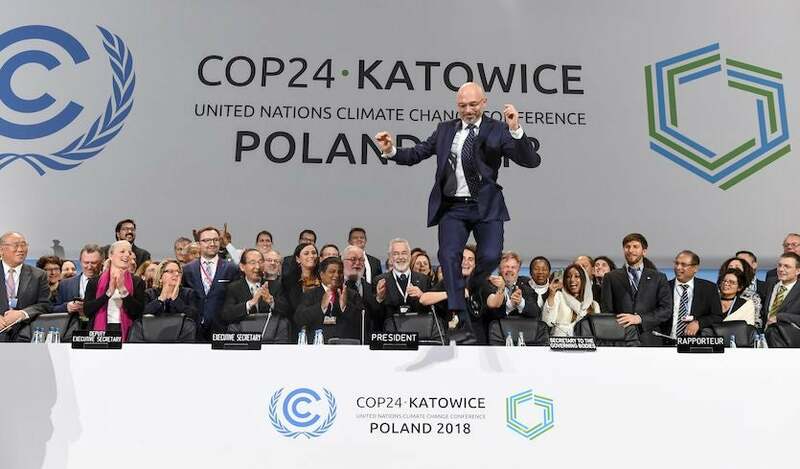 COP24 president Michal Kurtyka jumps at the end of the final session of the COP24 summit on climate change in Katowice, Poland, on Saturday, December 15, 2018. Image credit: Janek Skarzynski/AFP/Getty Images. Call me a pessimist, but I see 2019 playing out with the most utter RF ever done in American politics. The Dems will railroad Trump out of office – in blatant defiance of reality, and call it ‘due process’ and pat themselves on the back – and in good William Wallace tradition, all those that should have Trump’s back will RF him too – the press will tell us all it was completely legit (while covering up the REAL crimes by Obama, Hillary, the FBI, AND themselves). Then the progressives will complete their agenda – imposing it on all of us, as they have done in temper-tantrum fashion wherever they’ve already been able to in their power-base regions. We will be forced to sit and watch. And then it will be over and done. I’m really not looking forward to 2019. The cities, counties and states, institutions and organizations which proclaim that “We Are Still In” need a reality check too. The signatories in the link above who are planning on being partially or wholly renewable by such-and-such a date will likely need to start planning on going partially of fully off-grid sometime before their deadline date. It is my understanding (and the reader is free to correct me if I am wrong here) that electric utilities cannot control the source of the electricity coming into any particular home, business, govt office or institution. The grid is likely to be highly dependent on fossil fuel generated electricity for a long time to come, so remaining on-grid will likely result in the “We Are Still In” crowd continuing its contribution to CO2 emissions for many years unless they go off-grid. Of course they will tout wind and solar energy as the savior for their “green” plans, but it well known here at WUWT that wind and solar energy dependency introduces a whole new set of problems–not that the “We Are Still In” crowd understands what those problems are…or that they really care. It is, to say the least, upsetting that the scientific illiteracy of individuals and entire communities and states can be taken advantage of by the climate alarmist and environmental movements that enable them to pull this off. The environmental movement’s apparent alliance with the socialistic/leftist IPCC has certainly been a big factor. As far as I am concerned, seeing some of the “We Are Still In” communities mandating renewables demonstrates a subtle and tacit admission that wind and solar energy do not work without using the force of govt to shove them down the throats of everyone. I don’t recall cellphones and smartphones, personal computers, etc., requiring any such govt mandate. Maybe someday when this whole thing blows over, it will be a fascinating subject of study for psychologists and sociologists wondering how something like this could have ever happened. As Norman Bates said in Alfred Hitchcock’s “Psycho,” we all go a little bit mad sometimes…. That and the rest all true Jim. Except that there is no debate, at least of the type that takes up 90% of this site’s content. And Blogs ARE always irrelevant to the debate. The debate takes place via observation of climate and the consensus of what is thought those observations show, along with causative physics explaining. We still have certain denizens who deny even that there is a GHE acting on Earth (Mr Schroeder) at all – even though it states specifically in the Blog rules that that “Sky-dragon slaying” is not allowed. This Blog’s blatant raison d’etre is to trash it with dog-whistling headline posts. You get what you pay for and denizens will never get the truth by only viewing a skewing of it. And don’t say it doesn’t. Just try posting anything that isn’t an echo here, especially if early in the thread. Been there many times and got the T-shirt Ta. What’s the point? people (all except the most doughty) give up with it. That’s why I said not that long ago that the perception you lot have of winning is laughable (Mr Hoffer). Shooting down by virtue of numbers and ad hom is not “winning” and neither will it ever be. This place is an echo-chamber, where anyone who has the temerity to not input said echoes, gets jumped on (as the responses to Kristi’s posts show ) – via ad hominem. Charles and Anthony have some way to go to clear the ad homing trolls from here (as is their recent stated intent). (NB A troll is NOT someone who disagrees with you and posts links to science to back it up – it is someone who posts things to SPECIFICALLY cause upset, you know, like ad hominems). But yet we get that against Steven and Nick and occasionally Leif. To many on here are driven by a blind anger, carried over evidently from political polarisation. This post panders to the most base level of that polarisation. Yep it’ll get the denizens cheering but is quite, quite useless and counterproductive. There is my friend and the mole most whacked. Oops, sorry. It’s a scam maybe? Models aren’t needed and Hansen proved a basic one back in ’88. Never mind Arrhenius in 1896. Well yes, yes, that’s “stating the bl***ing obvious” (more Basil Fawlty). Things can have negatives as well. Like smoking is social and calming but large numbers paid for the habit decades later. (Mmmm I seem to remember a great denial of that too). Probably still in some politically right extreme represented here. In a sensible manner that is. Now the “settled” science thing is that the Earth is slowly warming and the cause is anthro GHG emissions. The “unsettled” part is to what extent. We have the constant popping up of moles that denizens refuse to accept have been whacked to oblivion. Arrhenius calculated that 2x CO2 would raise the GMST by ~ 4C 120 years ago…. “According to Arrhenius, he spent a full year in tedious manual calculations for the paper, in various stages. Firstly, he sought to derive figures for the heat-absorption capacity of water vapour and carbon dioxide from detailed observations on the intensity of moonlight at Earth’s surface carried out by Samuel P Langley in 1885-7. He then calculated mean actual temperatures and humidities at different locations around the world, and then the calculated effects on temperatures in different parts of the world of carbon dioxide levels at 67%, 150%, 200%, 250%, and 300% of the actual one at the time he wrote. He calculated that doubling the carbon dioxide level in the atmosphere would raise the temperature in general by 4°C”. And no one’s shown that not to be the case since. Today the IPCC says 1.5 to 4.5C. Yes, there is NV and it DOES modulate the GMST trend over relatively short periods (aerosols after WW2 until ~1970. The +ve PDO/AMO regime through the 30’s and 40’s. The -ve PDO/ENSO regime ’98 to ’15). The latter would have produced a cooling effect with 280ppm CO2 rather than reduced warming at ~400ppm. And why is OHC climbing? and has been since ~1970 (when the +ve forcing of the GHE started to sig outweigh the negative of aerosols) … and is on an accelerating trend …..
And no, it’s not a recovery from the LIA, as that did not end ~1970. Oh,and finally, we have the hypocrisy. Yes, thank you Mr Hoffer (whom I alluded to above). Yes, yes David this place is a paragon of climate science, even-handed and full of genius scientists that outnumber those contributing to the IPCC ARs, and with no political axe to grind. And what’s more the split there here is 50/50, such that views contrary to it’s dog-whistling are allowed to be heard and their links to peer-reviewed science considered dispassionately and not pounced on with venom. Pull the other one my friend. The rabbit hole’s deep here .. but surely not that deep. Oh .. forgot – it’s a scam. Lemme see, Libre gives your comment a count of 1060 words. And it’s still here…. Part of the progressive mindset, is to position yourself as a victim. Although I have yet to hear Nuremberg Trials being referenced to a Warmist. Quoting you, Mr. Banton, shows that you have indelibly contradicted yourself, because your post was published. It’s a shame that you cannot entertain opposing ideas without getting your boxers in a bunch. I lot of words – I call it rationalizing. See – we don’t LIVE here. The ‘echo chamber’ is the coordinated messaging of the mainstream press – see, THAT’s where we live – just like everybody else – and it’s the first thing we see and hear every day. And one more time – we are the RESPONSE to those with a political ax to grind. Maybe you should get out of your own rabbit hole and start questioning some of your own presumptions – especially about us. It would be interesting to add up the total cost of all of the COP meetings over the years. The reality is that the climate change we are experiencing today is caused by the sun and the oceans over which mankind has no control. If these people think that the use of fossil fuels is bad then at the very least they should stop flying to these meetings and hold them on the Internet instead. After all, it is their money that helps to keep the fossil fuel companies in business. Truly bizarre rant, why not come out here to BC in the midst of another of our climate change driven heat waves when the forests are burning all over the province and the smoke covers the entire continent to Quebec. Two years in a row of this here and it’s happening all over the world, something that actual experts have been warning us about fore decades. With much worse to come if you actually understand the issues and don’t have your head buried deep in a hole you’ve intentionally dug to hide from reality. This kind of lunacy would be hilarious if not for the fact that you’re dragging the rest of us down with you. I’m amazed that 22,000 activists from all over the world managed to travel all the way to Poland by bicycle. People who practice what they preach deserve praise. However, I’m concerned that the long peddle home might be too much for them. Perhaps somebody should invent a medium that allows people from different parts of the world to communicate in real time. From what I understand from recent events in the U.S.A. , violations of the Logan Act should now be prosecuted?